区块链日报 - Is the U.S. Losing the Race for Web 3.0? With China and Europe leading blockchain development globally, here’s what the US needs to do to catch up. Web 3.0 will revolutionize the internet. Vastly improved security, integrated payment systems, user control of data, and increased cyber defense from decentralized applications will create a more robust, secure, and inclusive system. It’s estimated that Web 1.0 and 2.0 added $4 Trillion to global GDP and created more than 25 million jobs in the U.S. alone. Web 3.0 is expected to add another $4 Trillion to global GDP and create millions more jobs. However, who will benefit from Web 3.0 is still very much up in the air. The U.S. has been the big winner of the web as we know it so far. Web 1.0 and 2.0 were built on U.S. terms and reflected U.S. values. For example: free exchange of information, open markets, etc. As a result, the U.S. got the jump on its competitors. The biggest internet companies are located in the U.S, and the greatest share of global internet value has been harvested by the U.S. However, this may not be true for the Web 3.0. The key technology for Web 3.0 is blockchain. Blockchain is a decentralized infrastructure design for the internet that allows multiple improvements in the way the web operates. Blockchain allows for low-cost, highly secure eCommerce, secure data sharing between connected devices in the Internet of things (IoT), decentralized data management in which users control data rather than big companies, and super secure data management and communication. Blockchain can be bring huge benefits to the U.S. economy and national security. According to the Global Intellectual Property Center of the U.S. Chamber of Commerce, sales from IP-intensive firms totaled $6.9 trillion in 2013. IP-intensive industries are also responsible for 56 million jobs in the United States — roughly 35% of the U.S. labor force. Moreover, a job with an IP-intensive company pays on average 26% more than a job with a non-IP-intensive company. The Commission on the Theft of American Intellectual Property (IP Commission) estimates that that the cost to the U.S. economy from counterfeit goods, pirated software, and the theft of trade secrets from these industries could be as high as $600 billion annually with the U.S. suffering over $1.2 trillion in economic damage. Blockchain can put a stop to this drain. By creating a system where digital and physical property can tracked and ensuring that creators of IP are compensated, Blockchain can create a self-enforcing IP control regime that will make it very hard for foreign firms to steal American-produced IP protecting America IP and protecting millions of jobs. Blockchain will permit low-cost, frictionless commerce that will dramatically reduce the cost of doing business, encourage new business growth, and slash the cost of transferring asset and eliminate unnecessary middlemen. In 2010, approximately 34 percent of U.S. GDP was generated by middlemen (e.g., brokers, dealers, agents). Blockchain “smart contract” would allow the automation of many of these unnecessary functions reducing overhead, marking U.S. firms more competitive, and creating millions of more jobs. In addition, blockchain creates transparent, accountable supply chains that can be automatically audited to ensure that firms comply with international labor, safety, and environmental laws. By ensuring that foreign firms are not able to evade these rules, blockchain technology can ensure that they will be unable to illegally undercut American firms. As a result, American workers would be able to compete with foreign workers on an even playing field without cutting wages or engaging in a “race-to-the-bottom” on workers’ rights and environmental protections. As digital technologies have transformed warfare, the U.S. military has become critically dependent on secure, timely, and accurate data. Blockchain can provide a key role in protecting our core defense data assets. Via its ability to provide secure, trackable, accountable data environments and automated smart contracts, blockchain promises to provide a new paradigm for decentralized management of U.S. defense and national security data assets. An example: blockchain can secure operations orders and planning documents, streamline and secure procurement and supply chains, protect the internet of military or battlefield things (IoMT or IoBT), and provide secure control of autonomous or swarm control. As cyber warfare becomes a key element in the battle space, so protecting digitally enabled assets will become more important. Blockchain’s inherent decentralization and built-in security means that it can provide the insurance to protect these assets and defense against enemy cyber threats. There has been some initial experimentation in these areas. For example, in 2016 the NATO Communications and Information Agency is began evaluating proposals in areas of application of Blockchain technology relating to military logistics, procurement and finance, Internet of Things, and other applications of interest to the military. In addition, the U.S. Air Force (USAF) will use SIMBA Chain, a blockchain platform to shore up its logistics and supply chain capabilities. SIMBA Chain is a cloud-based Blockchain-as-a-service (BaaS) platform. This government contract will enable the USAF to explore how blockchain technology might improve its logistics and supply chain capabilities. The current highly centralized paradigm for almost all major infrastructure and digital assets means that the U.S. is highly vulnerable to cyber-attack. From the power grid to Wall Street, the U.S. decentralized digital application built on the inherently insecure platform that is Web 1.0 and 2.0 means that the U.S. is susceptible to cyber-attack. This will only become a more as more and more devices become connected via the Internet of Things (IoT). Blockchain provides a mechanism to protect against cyber-attack. By decentralized assets and control and providing native strong encryption, blockchain technology provides a method to secure assets and protect our nation’s infrastructure. In fact, the U.S. Congress was sufficiently concerned to mandate that Section 1646 of the 2018 National Defense Authorization Act (NDAA) require that blockchain be assessed for military employment. Specifically, the Secretary of Defense and other federal agencies will be required to brief Congress “on the cyber applications of blockchain technology…[and] potential offensive and defensive cyber applications” by May of 2018. The NDAA language also requires an assessment of how adversaries and criminals are using blockchain and legal ways in which the U.S. government could integrate blockchain into dealing with these threats and protecting government networks and critical infrastructure. Web 3.0 Challenges to the U.S. Both Europe and Asia see the benefit of Web 3.0 and are investing heavily in the development of new Web 3.0 technologies. States and businesses in these regions realize that they lost the first two generations of the web, and are determined not to lose the next. Europe in many ways has led the development of blockchain adoption. The notable open source culture that permeates the continent lends itself well to the new dynamic of blockchain, and both private and public entities are actively involved in blockchain projects. In terms of blockchain hubs, the main concentrations of startups are in London, Amsterdam, Barcelona, Berlin, and Switzerland’s Crypto Valley. Estonia’s Guardtime is not only working with its own government to use blockchain for health records but has also contracted with organizations such as NATO. Plus, America’s Nasdaq has reached out to the tiny country in the Baltics to develop applications. United Kingdom’s chief scientist, Sir Mark Walport, unleashed a report in January 2017 outlining the potential of blockchain and showing how it can transform the delivery of public services and boost productivity in government. Soon after, GovCoin Systems Limited, a London-headquartered financial technology company, announced blockchain trials to support government aims in streamlining the distribution of welfare benefits while the Bank of England stated they are looking into the policy and technical issues posed by Central Bank Digital Currencies (CBDC) and developing blockchain proof-of-concepts. China is even more active. China has issued the most Web 3.0 patents, while many of the biggest and most innovative Web 3.0 firms are located outside there, and the government is already rolling out coordinated development programs aimed at putting their country in the forefront of Web 3.0 development. China realizes the benefit of Web 3.0, and has been investing heavily in Web 3.0 technologies. China is the largest holder of blockchain patents in the world with the People’s Bank of China submitting 41 patent applications in the last 12 months alone. China’s State TV has said China expects blockchain to be 10x more valuable than the internet. The China Center for Information Industry Development (CCID) officially publishes their ranking of crypto and blockchain projects consisting of the top 33 projects in their view. In September of 2018 China’s Supreme Court has ruled that evidence authenticated with blockchain technology is binding in legal dispute. A survey by Deloitte revealed that the U.S. is falling behind the U.S. in terms of blockchain deployment. 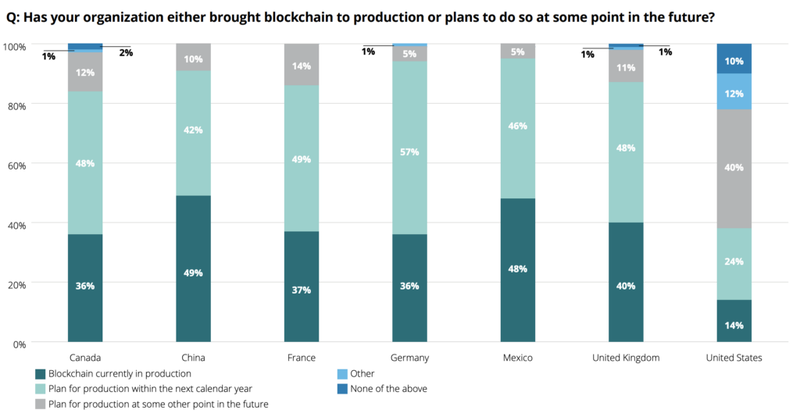 Of a thousand “blockchain-savvy” executives surveyed globally, more than 90 percent of Chinese executives said they had or planned to have blockchain solutions in production this year, whereas only 34 percent of American executives reported similar plans. The same survey reported that 98 percent of Chinese executives were hiring blockchain staff compared to 45 percent in the U.S. Similarly, there has been substantial interest within the Chinese military. An article in the People’s Liberation Army (PLA) journal the China Military Network Defense Department Network on February 2, 2018 argued that China’s defense and security agencies should leverage blockchain to manage the distribution of funds for intelligence operations, protect personnel and weapons life-cycle data from cyber-attacks, and make logistics operations safer. Furthermore, the article stressed that blockchain would alleviate three major dilemmas faced by Chinese government existing paper and electronic records in China: (1) centrally located files that usually lack back-up mechanisms; (2) safe and easy transfer of archival files; and (3) the lack of archival supervision. Moreover, as military logistics becomes smarter, blockchain can improve the enterprise logistics by making it more robust, dynamic, and resilient by creating interconnected device networks. As a result, this new enterprise is less risky and more survivable since it avoids a “centralized management strategy” that is over-reliant on a few critical information centers or other key geographical sites without giving up government. This theme was taken up in multiple media outlets across China, such as Xinhua and other PLA-friendly sites. Further, this past February, one Chinese website opined that blockchain could even be used in media operations to control both content and contributors in shaping public opinion. In this way, blockchain would be used to secure sources of public opinion, ostensibly to the detriment of any adversarial counter-information operations. More broadly speaking, public opinion warfare is one of three pillars key of China’s Three Warfare strategy (the other two being legal warfare and psychological warfare). It is not unreasonable to hypothesize that a Chinese dominated and designed Web 3.0 would use blockchain as method to create a decentralized, hyper-secure system for state control that could forever exclude Western parties from some operations and give Chinese security organization access to all manner of data. For example, China’s “One-Belt-One-Road” (OBOR) initiative will link 69 countries, connecting 40 percent of global GDP into a single trading system. A Chinese led Web 3.0 blockchain system will allow frictionless commerce to move through this system with a single coordinated asset tracking system under the control of China. Chinese “Smart Contracts” (complex business rules that specify how an asset it transferred and managed) could include hidden backdoors that gives the Chinese government data on all manner of transfers and forever protect the information it extracts behind an impenetrable, decentralized blockchain wall. Furthermore, Chinese manufactured IoT devices managed on an Chinese designed blockchain could contact hidden smart contracts that could be directed to conduct malign activities against American interests in the case of hostilities or spy or steal American data and hide the source of the cyber-attack behind blockchain secured cyber-walls. A Chinese Web 3.0 would not therefore not be open and transparent vision expressed by U.S., but would be an authoritarian system controlled by the Chinese government. Such a blockchain would allow China to set the terms for Web 3.0 and control digital communications, asset transfer, and global supply chains that pass through the Belt-and-Road system — potentially seriously impacting U.S. interests. What Does the U.S. Government Need to Do? Unless the U.S. government acts now, we risk losing the race for Web 3.0 and having to develop within an imposed Web 3.0 system in which numerous bad actors might be able to exploit the U.S.’s growing dependence on digital data. Develop Comprehensive, Coordinated Web 3.0 Policy: This policy would support the development of the blockchain industry, support R&D, and provide funding and executive and legislative direction to Federal agencies to explore the use of blockchain for civilian, military, and national security initiatives. Create Incentives for Blockchain “Miners” to Locate in the U.S.: Blockchain “miners” are essential for verifying blockchain transactions. Currently most of the nodes our of which these miners’ operation are in China and Europe. The U.S. needs to provide tax incentives to bring transaction validation back to the U.S. and ensure that the U.S. dominates the process by which blockchain operations are verified. Taken together, these steps represent a firm basis for the U.S. to begin becoming a key participant in the emergence of Web 3.0. If action is taken now, governmental and business interests in the U.S. can be assured that they will play a key role in the design of Web 3.0 and that U.S. and Western interests and values are clearly considered as the future of the web develops. Is the U.S. Losing the Race for Web 3.0? was originally published in ConsenSys Media on Medium, where people are continuing the conversation by highlighting and responding to this story.